About The Market: A recent report regarding family reunions revealed that 35.1% had reunions of 51-100 in attendance. 18% had attendees of 26-50 and 11% were 101-500, while almost 20% had reunions of 200 attendees or more. The largest group had 1,000 attendees. Welcome to the Award Winning Family Reunion Planner Affiliate Program. As an affiliate member you have the opportunity to earn big simply by promoting our award winning products on your website, in newsletters and offline as well. Work fron home online- Offer event planning Family Reunion Keepsake Book, Sofware, eBook and CD . While you can use this guide to increase income streams, drive family reunion planners and committees to your websites resources event planning references, entrepreneurs like yourself can also offer the keepsake guide as marketing material to the hospitality industry in which you live. Present the perfect hospitality gift that draws more clientele to hotels, resorts, cruiseline agencies, retreats and time share directors! This 8x10 size paperback book includes personalized keepsake features that are a must have to event planners. The personalized keepsake guidebook CD and ebook helps the event planner/committee go thru every step of planning the family reunion while narrowing down possible locations according to selected themes, activities and destinations. Sign up now to become a reseller and join our affiliate program in 3 Steps. 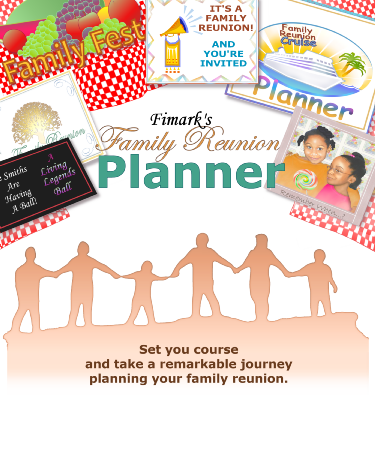 Terms of Agreement: In this agreement, the term "Participant" refers to you (the applicant), and "sponsoring website" refers to the website from which you will link http: //family-reunion-planner.fimark.net. Wherever the agreement refers to "you" or "your", it means "the Participant"; "we" or "our" refer to Legendary Heritage Heirlooms and the term "planner" refers to all product provided by Legendary Heritage Heirlooms. You can add or remove links at any time: You may add as many links to Legendary Heritage Heirlooms, or remove such links, at anytime and without prior approval from Legendary Heritage Heirlooms. Referral Fee: Qualifying Family reunion planner products: Family reunion planner products sold by Legendary Heritage Heirlooms . originating from a special link at your sponsoring website qualify to earn you referral fees. The following Family reunion planner products will be considered "qualifying": Family reunion planner products that meet the following criteria: Family reunion planner products sold to customers who follow a special link from your sponsoring website to our site and submit that order by using Legendary Heritage Heirlooms order forms. The following Family reunion planner products or service will not be considered qualifying for referral fees: Family reunion planner products or services sold through any other special link to our site other than the specific URL that you are assigned to your sponsoring website. Referral Fee Amount: Only qualifying Family reunion planner products that are sold by Legendary Heritage Heirlooms , provided to a customer after completion of all customer ordering requirements (i.e.., completion of Order Form) and for which Legendary Heritage Heirlooms has received full payment will qualify for a referral fee. The total of such sales in any given month will generate referral fees, based upon the applicable referral fee, according to the following schedule: The Family Reunion Planner - Only $29.99 - Earn $5 per sale The Family Reunion Planner on CD-ROM - Only $69 - Earn $20 per sale Deluxe Family Reunion Planner Organizer Package 25 Printed Sheets, CD-ROM and black leather organizer binder with pockets and dividers. Complete Planner software download included - only $129 - Earn $30 per sale Referral Fee Payment: Legendary Heritage Heirlooms . will send a referral fee check for the applicable referral fees approximately 5-10 days after the 20th of each month for the previous month. You must have earned at least 25.00 for that month to receive payment, otherwise the amount will carry over into the following month until such time 25.00 is accumulated. Referral Fees: Fees range from $5 to $30. Returns and Cancellations: If a referral fee of a qualifying product is later returned by the customer, its referral fee will be deducted from the next monthly payment sent to the Participant. If there is no next monthly payment, the Participant will be billed and accepts obligation of repayment by agreeing to these terms. Order Processing: Legendary Heritage Heirlooms will be solely responsible for processing every order placed by a customer following a special link from your sponsoring website. Order entry will use Legendary Heritage Heirloom's online order form or secure online ordering process. Order forms, payment processing, shipping, cancellations, returns, and related customer service are the responsibility of Legendary Heritage Heirlooms. All of the rules, operating procedures and policies of Legendary Heritage Heirlooms regarding customer orders and accounts will apply to orders we receive through special links on your sponsoring website. Legendary Heritage Heirlooms reserves the right to reject any order that does not comply with our rules, operating procedures and policies. In addition, due to the nature of the internet, we cannot guaranteed that all potential customers originating from a affiliate link will be captured and thus credited. We will only pay affiliates based on successful capture and payment of orders. Acceptance of this agreement accepts such conditions. Tracking of Sales: Legendary Heritage Heirlooms will be solely responsible for tracking sales we make to customers who follow special links from the sponsoring website. The Participant will be solely responsible for ensuring that these special links are formatted properly, a necessary prerequisite to tracking such sales. Statements of Family reunion planner products sales activity will be provided to the Participant in real-time with a special URL that they are assigned. Promotional Techniques: You are free to promote te link to Legendary Heritage Heirlooms in all the ways possible excluding inappropriate Internet marketing techniques. Examples of acceptable ways to promote the Family reunion planner products is: through banners, text links, letters of recommendation to newsletters subscribers or your client base. However, if you use SPAM (in any way, shape or form, including email and newsgroup spamming), or offer the Family reunion planner products on any WAREZ, CRACK, or SPAM oriented site, your account will be immediately terminated! Any upaid sales generated will NOT be paid and will become the property of Legendary Heritage Heirlooms . Copyrighted material: As the Participant, you are solely responsible for ensuring that your reviews, Family reunion planner products descriptions and articles (if applicable at your site) obey all applicable copyright and other laws. You must have express permission to use another party's copyrighted material. Legendary Heritage Heirlooms will not be responsible if you use another party's copyrighted material in violation of the law. Legendary Heritage Heirlooms policy applies to all orders: Every customer who buys a Family reunion planner product through this program is deemed to be a customer of Legendary Heritage Heirlooms, excluding the approved affiliate, who does not qualify for the referral fee for self use. The Participant does not have the authority to make or accept any offer on behalf of Legendary Heritage Heirlooms. All Legendary Heritage Heirlooms policies regarding customer orders, pricing and problem resolution, will apply to these customers. Legendary Heritage Heirlooms is not responsible for any representations made by the Participant which contradict our policies. Family reunion planner products prices and availability: The price charged for every Family reunion planner products sold under this program will be determined by Legendary Heritage Heirlooms according to our own pricing policies. In case of any price discrepancies, the price charged to the customer will always be the price listed on Legendary Heritage Heirlooms webpage linked from your sponsoring website. Family reunion planner products availability can change, and Legendary Heritage Heirlooms will present the best information available to all sponsoring sites and its clients regarding Family reunion planner products availability. Website service interruption: Legendary Heritage Heirlooms will make every effort to keep its website operational. However, certain technical difficulties may, from time to time, result in temporary service interruptions. The Participant agrees not to hold Legendary Heritage Heirlooms liable for any of the consequences of such interruptions. Term of the Agreement: The Participant may receive referral fee payments on qualifying orders that are placed during the term of this agreement. This term will begin on the date that your application is approved by Legendary Heritage Heirlooms , and shall end when canceled by either party as provided below. Referral Fees earned through the date of expiration or cancellation of this agreement will remain payable only if the Family reunion planner products are not returned or canceled from their orders. Payment of the final referral fee payment to the Participant may be withheld for a reasonable time in order to ensure that the correct amount is paid. The agreement may be modified: Legendary Heritage Heirlooms . reserves the right to change any of the terms and conditions in this agreement, at any time and in its sole discretion, by posting a new agreement on our website. You can review these agreement here at anytime. Cancellation of this agreement: Either Legendary Heritage Heirlooms or the Participant, acting in their sole discretion, may choose to cancel this agreement at any time by written notice of cancellation to the other. Warranty Disclaimer: Legendary Heritage Heirlooms makes no warranties, representations or conditions with regard to the program or, except as expressly set forth in Legendary Heritage Heirlooms 's then current Family reunion planner products sales policies, any Family reunion planner products sold thereunder, whether express or implied, arising by law or otherwise, including without limitation any implied warranty of merchantability or fitness for a particular purpose or non-infringement or any implied warranty arising out of Family reunion planner products of performance, Family reunion planner products of dealing or usage of trade. Limitation of Damages: Legendary Heritage Heirlooms shall have no liability for any indirect, incidental, special or consequential damages or any loss of revenue or profits arising under or with respect to this agreement or the program, even if Legendary Heritage Heirlooms has been advised of the possibility of such damages. Further, Legendary Heritage Heirlooms . 's aggregate liability arising under or with respect to this agreement or the program shall in no event exceed the total referral fees paid or payable by Legendary Heritage Heirlooms to Participant under this agreement. Miscellaneous: Participant and Legendary Heritage Heirlooms . are independent contractors and nothing in this agreement is intended to or will create any form of partnership, joint venture, agency, franchise, sales representative or employment relationship between the parties. Participant shall not assign this Agreement, by operation of law or otherwise, without the prior written consent of Legendary Heritage Heirlooms . Subject to the foregoing restriction, this agreement is binding upon, insures to the benefit of and is enforceable by the parties and their respective successors and assigns. Governing Law: This agreement shall be governed by the laws of the United States and Canada without reference to its choice of law principles. Step 1. Read the Terms of Agreement. Step 2. Agree to the Terms below. Step 3. Proceed to step 4. Step 5. Click here next. � 2005, 2006, 2007, 2009, 2009, 2010, 2011 Fimark Home Online Company. All rights reserved.